As I write this, I am standing alongside 30 of the last 200 survivors of the Nanjing Massacre, which began 76 years ago Friday. 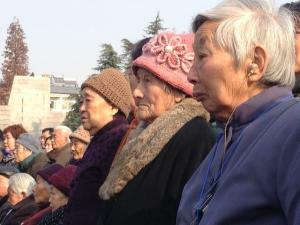 Sirens sound around this Chinese city as the last few eyewitnesses of a massacre gather. Starting Dec. 13, 1937, and lasting six weeks, as many as 300,000 civilians were murdered during the atrocities. The remaining survivors bow their heads in memory as the sirens blasts above their heads. A flock of pigeons is released into clear blue skies above the 5,000 people gathered in the square of the Nanjing Memorial Museum. The ceremony closes with marching soldiers laying wreaths as the memorial bell is sounded. 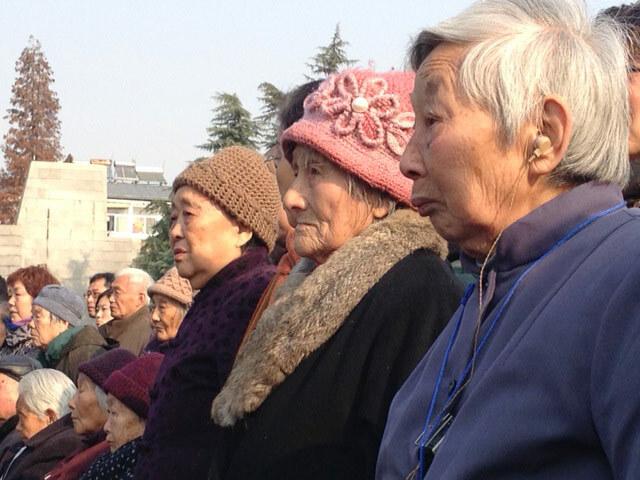 Standing sandwiched between survivors, soldiers, Buddhist monks, state officials and thousands of school children, I become aware of just how deeply the Nanjing Massacre resonates across Chinese society. There is reverence and solemnity, which is touching, particularly as the survivors are honored for their presence. The media outlets clamber for their photos as they stand in a line before large yellow wreaths of flowers. I have the opportunity to personally thank Madame Xia Shuqin and Mr. Lee Gaoshan for being among the first of 12 survivors to give their testimony to the USC Shoah Foundation, which today announced its partnership with the Nanjing Memorial Museum to collect as many as 100 testimonies from the 200 survivors of the massacre still believed to be alive. Madame Xia stands below a large “300,000” carved into stone above her, and thanks us for the opportunity to make her testimony known. The octogenarian previously sued Japanese deniers of the massacre through the Chinese courts and still has a case progressing through the Japanese courts. The warrior of historical truth is unbowed in her final years to the distortion of her experiences. The significance of the Nanjing Massacre on the memorial landscape is seen first through its scale. By way if comparison, the site dwarfs the United States Holocaust Memorial Museum in footprint and attracts over six million visitors a year. As the crowd subsides, I drift into a temporary exhibition space where Chinese visitors to the museum are filing through an installation about Auschwitz. There is purpose behind this. The museum wants to broaden the scope of its educational mission and to educate the Chinese public about genocide. The history of Auschwitz is one way to begin. As the memorial bell rings across the square, the survivors make their way home for another year. Soon, very soon, that dwindling crowd will be no more, and only their voices we preserve will remain. Stephen D Smith is the Andrew J. and Erna Finci Viterbi Executive Director Chair of the USC Shoah Foundation in Los Angeles, whose Visual History Archive holds 53,000 testimonies of eyewitnesses to the Holocaust and other genocides. He also holds the UNESCO Chair on Genocide Education and is an Adjunct Professor of Religion. He founded the UK Holocaust Centre, The Aegis Trust for the prevention of crimes against humanity and genocide. He was Project Director of the Kigali Genocide Centre, Rwanda. Smith, who trained as a Christian theologian, is an author, educator and researcher interested in memory of the Holocaust, and the causes and consequences of human conflict.